The unveiling of Rock on Top of Another Rock at the Serpentine Gallery marks the first and only instance of a Fischli/Weiss public sculpture in the UK. It’s a misty Friday morning in Kensington Gardens. You might expect this to add a suitable air of gravitas to the launch of the first and only Fischli/Weiss public sculpture in the UK, following the untimely death of David Weiss in 2012. However, although Rock on Top of Another Rock has personal resonance for those involved in making it happen, this doesn’t mean the event is full of solemnity. On the contrary, the humour that abounds in Fischli/Weiss’ ouevre is apparent in the way both Peter Fischli and curator Hans Ulrich Obrist talk about the piece. Though monumental, it was specifically rocks found lying around that influenced the first incarnation of Rock on Top of Another Rock, in the Norwegian wilderness. Fischli and Weiss were interested in how a work, even of such scale, could become lost in the landscape to the point where a viewer might question whether the authorship was natural or manmade. The work is “a minimum gesture that has a maximum effect – you just need the crane,” Fischli explains. Centred on the grass in front of the Serpentine, where it will remain for 12 months before moving permanently to Doha, the work changes from being a humorous suggestion of incidental mark-making, into a purposeful statement that references formal sculpture – it is roughly the same size as other public works within Kensington Gardens. “As an artist, when you have an idea, you want to do it the next day, but with a project like this you need to know it takes time,” says Fischli, referencing Martin Kippenberger, who famously stated that ‘a good artist has less time than ideas’. 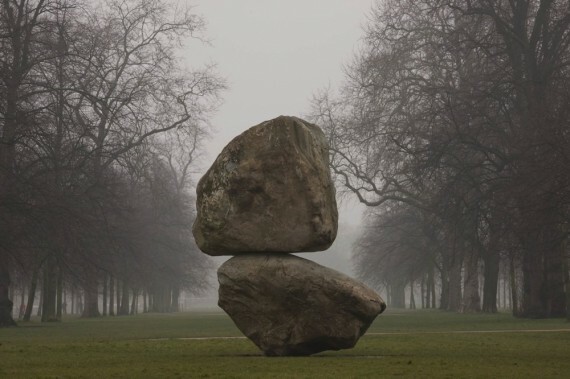 ‘Rock on Top of Another Rock’ is presented jointly with Qatar Museums Authority as part of Qatar UK 2013, a year-long cultural exchange between the two countries.